The Internet has really changed things for artists in the last few years. For the better. It’s now less difficult to build an online following and promote your music to a wider audience. A solid website helps you keep fans in the loop and share your work. You can advertise gigs, build your personal brand, and spread the word about upcoming singles/albums. And with the right WordPress theme, you can do so with minimal time and effort. Sounds great, doesn’t it? Well, if you’re ready to give your site an upgrade, we’re eager to help. Here are the best WordPress music themes currently on the market. 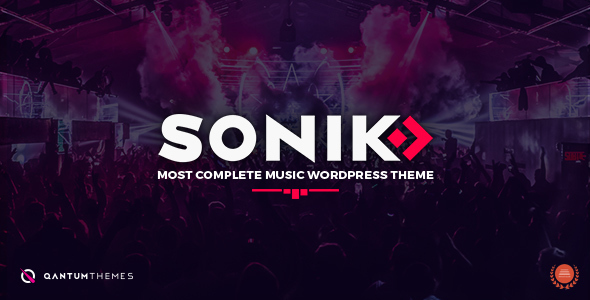 Sonik works for a plethora of music-related businesses, from musicians to bands and from DJs to digital labels and music magazines. It comes with four demos ready to import and it’s extremely versatile and flexible. Moreover, it offers several niche post types that will come in handy – band members, events map, album releases, music charts, and so on. Its list of impressive features doesn’t stop here. Sonik also packs the Visual Composer plugin, so you can drag and drop elements to create beautiful page designs without touching a line of code. It’s integrated with WooCommerce, translation ready, and SEO optimized. In other words, it’s a complete solution for anyone looking to launch a smashing music website. 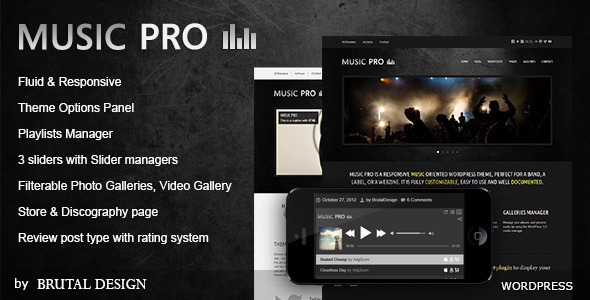 Music Pro is fully customizable, easy to use, and well documented. It comes with 3 premade skins, 3 homepage sliders, and 8 posts formats for your blog. It also includes the pumped jPlayer, with playlists manager and song uploader features. Custom widgets, show dates, and a discography pages are also included in the mix. All in all, a pretty solid choice and one of the best music WordPress themes currently available. We love Vice mainly because of its amazing design, but we can’t ignore its advanced functionality either. Infinite color possibilities, transparent glass design, custom icons – Vice offers all this and more. It comes with an advanced music player, 5 custom post types, as well as niche sections like podcast, event, and gallery. Slider Revolution is included. So are video tutorials, in case you need some extra help setting it up. Posh and fast, MashUP stands out from the crowd thanks to its gorgeous design and amazing functionality. You can upload albums, make tracks available for download, and promote events. The drag and drop page builder keeps things simple, while the theme’s advanced customization options allow you to easily personalize colors, fonts, etc. 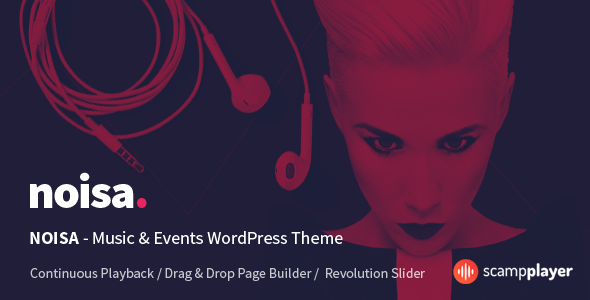 The theme also bundles the Revolution Slider, so you can create an even more eye-grabbing site to dazzle your followers. 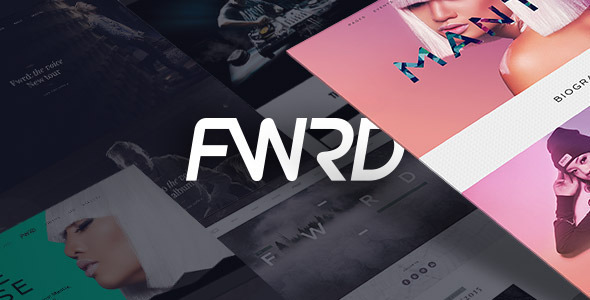 FWRD is a comprehensive and powerful theme, with several advanced features you’ll love to use. 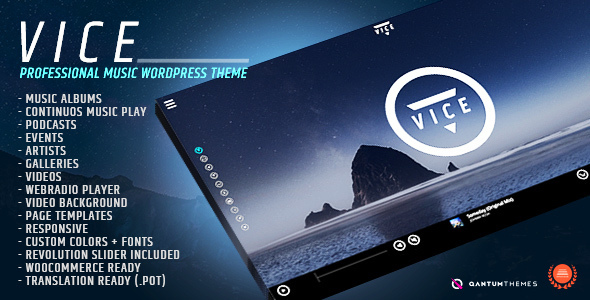 The theme comes with Visual Composer and 13 creative custom widgets. It has a user-friendly menu builder and offers video backgrounds and a stunning parallax effect. The Essential Grid and Slider Revolution plugins are also included. Furthermore, the theme makes it easy to manage events, upload tracks, manage playlists, and sell merchandise. A complete WordPress solution for musicians and labels alike. Noisa was created using AJAX, so your music won’t stop playing while visitors browse your site. It has 5 Visual Composer music widgets, SoundCloud support, 4 player skins, and easy track management. The Events section is well-developed and doesn’t require any additional plugins to work its magic. SEO-friendly and easy to customize, Noisa also bundles the Visual Composer and Revolution Slider plugins, saving you some serious cash. 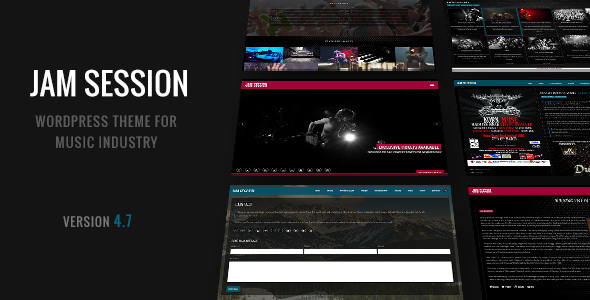 This stylish theme features a full-screen slider, responsive masonry archive layout, and custom post types – for discography, events, photo gallery and videos. It comes with a powerful theme option panel and it’s insanely easy to configure. You get the Visual Composer and Slider Revolution plugins for free. Plus, the theme is fully integrated with WooCommerce, so you can set up your very own online shop without breaking a sweat. As expected, an audio player is also included. No list featuring the best WordPress music themes would be complete without Musik. Using the popular Easy Digital Downloads plugin, the theme’s main focus is to help you sell music, making it an ideal choice for DJs or record labels. Rolling over the artwork for each tune will reveal a purchase link and preview button that plays the track in an audio player. Moreover, the player saves user preferences for volume, repeat and shuffle settings. Pretty cool. Beatheaven is a powerful theme that offers multiple slider types and several built-in page layouts that might come in handy. The theme’s audio player was designed specifically for this theme and works great with both different browsers and different screen sizes. Beatheaven is also translation ready, SEO-friendly, and easy to install and customize. 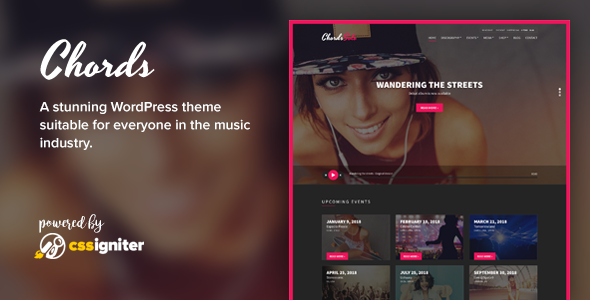 Rounding up our list of smashing WordPress music themes, Chords has plenty to offer. Features include a custom audio player with streaming support, discography management, events management, and WooCommerce integration. You also get an intuitive builder for the homepage and powerful settings that will help you easily tweak and update your site. Last but not least, Chords is very SEO-friendly, so you’ll be able to expand your fan base without too much hassle. Yay! If you’re looking to keep things simple, this is the perfect choice for you. 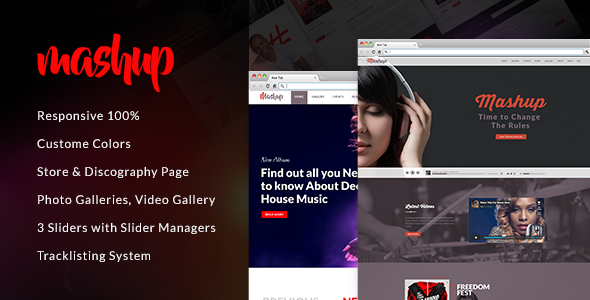 Applause is a one-page theme that packs 2 header options, 6 custom post types, and the 360UI music player. It’s great for displaying events, photos, playlists, and so on. It also bundles the Unlimited Playlist plugin. You have all the features you need to build a minimal, yet gorgeous and informative website. 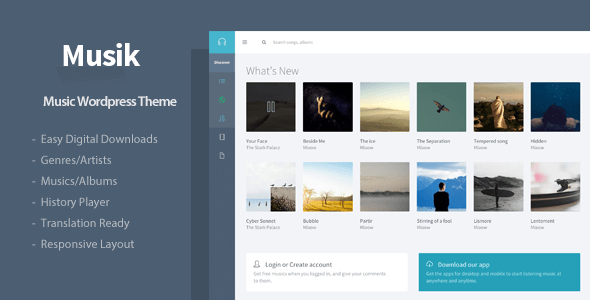 Why Choose One of the WordPress Music Themes on Our List? The best WordPress music themes available have a few things in common. Stunning design and a powerful media player, for instance. Events management functionality is also a plus, since you want to be able to promote your gigs in style. If you’re looking to sell merchandise, WooCommerce integration is a must. All the themes on our list come packed with everything you need to get your website up and running as soon as possible. Even better, they’re very easy to use, so it’s unlikely you’ll need any outside help to tweak them. You can save precious time to focus on what’s really important: singing your heart out. Don’t settle for a bland, default theme. Invest in building an impressive online presence and you’ll be reaping the rewards in no time. Each of the WordPress music themes on our list comes with powerful features that will help you reach a wider audience. Fans will be impressed by how professional your website looks and they’ll keep coming back for more.